King Street in Newtown is famous for a lot of things. It is alive with Thai restaurants, great bars and an eclectic mix of people, but one thing I think Newtown does best is gelato. There are three gelato places along King Street and all of them do mouth wateringly delicious, totally worth the trip to Newtown gelato. This gelato place is the closest to Newtown station and most central in Newtown. It is the one I've been to the most and my favourite of the three (though that may depend on the gelato I'm holding in my hand at the time). They have an amazing selection of gelato ranging from chocolate, cookies and cream and tiramisu to blood orange, banana bread and pistachio. My personal favourite is the Raffaelo for the chunks of white chocolate and coconut that go so well together in gelato. You are bound to find a flavour here to tempt your taste buds. They also offer dairy free and vegan sorbet in a few flavours for anyone with dietary requirements. If you just can't get enough they have tubs of gelato that you can take home or gelato cakes for customers who pre order. If you're not in the mood for a scoop of gelato they also offer a full range of delicious desserts including pancakes and waffles that come with fresh fruit and a scoop of gelato on the side, warm cinamon coated nuts and coffees. Half of their store is dedicated to Nina's hand made chocolates. These scrumptious chocolates are the sort that are decorated like a penguin or a basket of flowers (you know the ones). Unfortunately, the selection of Nina's chocolates is so tasty and so extensive that you will probably be standing there for a while making up your mind. Her chocolates are a little pricey, starting from around $3 each. For information on Gelato Blue visit their website. For more information on Nina's chocolates visit their website. This store is just a short walk in the direction of the city from Newtown station. Gelatomassi arguably has the best chocolate gelato in Newtown. Their traditional chocolate is definitely a crowd pleaser, but it was their chocolate mud cake with actual chunks of gooey chocolate mud cake that has me coming back for more. Gelatomassi is the only gelato place in Newtown that does only gelato (besides some beverages including coffee and smoothies) and as such they have a massive range of flavours including, lemon cheese cake, sticky date, blue vein cheese and many many more. 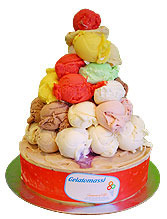 They also offer quite a range of gelato cakes that are artistically done and super tasty. This gelato place is the furthest from the centre of Newtown and unfortunately is the one I have been to the least. I can vouch though that their Belgium chocolate gelato was very morish. Ice and Slice also has the smallest range of gelato and that is probably because they have a lot more than just gelato. As the name suggests they offer an extensive range of pizzas, salads, pastas, coffee and cakes. What appeals to me most about this gelato place though is their gelato sundaes. An extensive menu of gelato dessert combinations they have created including 'Peach Melba' - a creation that involves poached peach with vanilla bean gelato, raspberry sauce, fresh cream and toasted almonds, or an 'Innocence' which has white chocolate, hazelnut and espresso gelato with fresh cream and a dash of Kahlua. 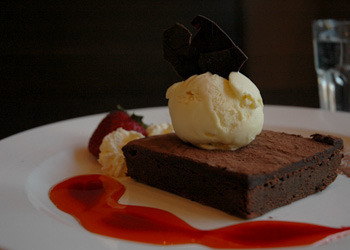 Whichever gelato place you visit I'm am sure your taste buds will be pleasantly indulged. I love Gelato Blue! Such a big range of flavours, it's always really hard to decide which ones to get :) And I've always been tempted by all the handmade chocolates but haven't as yet tried any...but I might have to next time! I'm enjoying a delicious Italian-style iced coffee at Ice and Slice right now. Friendly staff, reasonable prices and a sunny courtyard. What more could one want on a summer afternoon? Four stars.